The house is 1750 square feet of living space with 800 square feet of covered front and rear lanais. The house is 75 steps across the road to the beach and water. Noho Kai has two master suites, each with king-size beds, private bathrooms, and French doors that open to the front lanai. They are identical in size and separated by the great room for privacy. The third bedroom has twin beds with its own private lanai and a one-half bath across the hall. The Great Room and Kitchen are open and spacious with high ceilings and french doors opening to the front lanai. Ceiling fans in all of the rooms. Click on our link below to see more photos and information on Noho Kai. You can check our calendar below or on our web site. 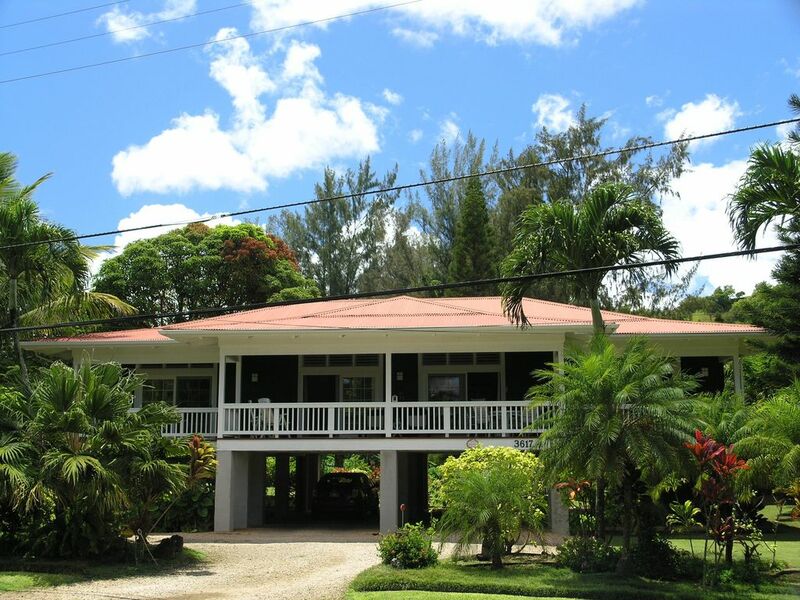 Anini Beach is an exclusive enclave of homes located on the North Shore of Kauai. It is protected by the largest reef in the Hawaiian Islands which makes it a wonderful beach for small children. Anini Beach is so popular that it books more than a year in advance. Ocean View is limited thru trees and folige. (3) In Great room and both Master Bedrooms. HBO in Great room. Extensive VCR library of childrens films. Comfortable stay with a large yard to BBQ for our family of 4. Even during the mini Hurricane that blew in 2 days after arriving, it made for a fun adventure when the power went out. As night was settling in and the power was still out we found candles and three flashlights so we could play Uno in the candle light. The kids enjoyed it and thankfully the power came on after about 11hours. Having the path right across the street to the beach was a treat. Our only complaint and is of no fault to the owners was the surprisingly loud cars blowing down Anini Rd. But other than that we enjoyed falling asleep to the sound of the ocean (the tide was especially high during our trip). Thank you for allowing us to stay! Beautiful location, great design and appointments that is perfect for groups of six. The single complaint results for the fact that ours was a working vacation, and the lighting was rather dim for reading and writing. For those more forutnate, who don't have to work in paradise, this shouldn't be a problem. This home is gorgeous, simply amazing access to the beach, well stocked, clean and spacious. What a gem! We loved our stay and enjoyed every minute in this gorgeous home. Instructions for arrival and departure were communicated in advance and everything went perfectly, smoothly. The kitchen is well stocked with cooking supplies, there’s a nice library, and really everything you could possibly want for a perfect Kauai vacation. We’d stay there again in a heartbeat, and indeed plan to go back soon! Beautiful home, yard and location. The house is equipped with everything that we needed to be comfortable. The beach is right across the street. The only downside is the roosters that like to talk during the night but they added to the experience. We will definitely stay again when we return to the island.